Losing weight requires you to burn fat and achieve a calorie deficit. To maximize your fat burning and weight loss you need a strategy consisting of cardio, strength exercises and low carb diet. Cardiovascular exercises are the most effective tools to enhance your fat burning as well as your health. Running, HIIT, swimming, and air drilling, power walking, jogging, elliptical trainer, are all great options because they engage many muscle groups. Performing complex resistance exercises that engage more muscle groups will help you to tone your muscle during burning your fat. You can add in your programs heavy squat, sit up, push up, lunges, planks in your workout routine. Besides exercises, low carb diet will help you to reach your goal faster, however, it is not easy to eliminate sugar. 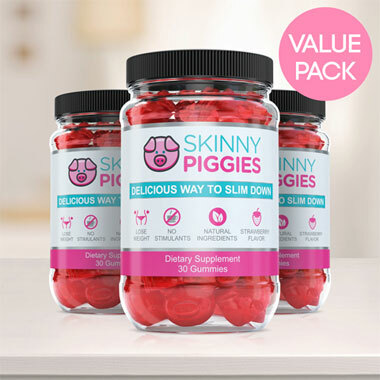 Skinny Piggies, appetite suppressant gummies to help you feel full and consume far fewer calories. These yummy gummies, taken with a full glass of water between meals. Why Is Everyone and Thier Dog Talking About Yummy Slimming Gummies? We all love to eat great-tasting treats, but they unfortunately pack on unwanted weight. 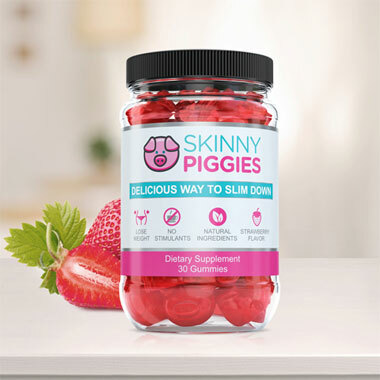 Now, you can help your weight-loss eating plan by chewing on novel hunger suppressant gummies with a funny name: Skinny Piggies. These are delicious diet dietary supplements that reduce food cravings and appetite while supporting your body to remain in fat loss mode. Losing weight is quite straightforward: Take in fewer calories than your body burns offeach day and your body will start losing fat, it's so simple! However once you start cutting down calories, and hunger becomes impossible to control. This is where Skinny Piggies Gummies come to the rescue! These savory hunger suppressant gummies are formulated to not only help you satisfy cravings, but also help you to stick with your diet regime by reducing hunger. The concept behind Skinny Piggies gummies is pretty straightforward. Your hunger is controlled by 2 key ways: the number of calories you consume and the presence of food in your stomach. After a meal, your stomach expands in size from the food pressed up against the sides, which results in you feeling satisfied and you stop eating. When you take a Skinny Piggy 30 minutes prior to your dinner with a 16oz glass of water, it will gently form a gel, that activates receptors in the stomach, letting your brain know you just ate lots of food. So that when you have later, you are somewhat full and consume far fewer calories because of it. This way you can combat the urge for food and hunger, food cravings, and keep eating less, all without feeling hungry all day long. The soft gel allows the stomach to empty gradually and that makes you full much longer. The sooner you are full, the less likely you will continue to eat which allows you to eat fewer calories. As the soft gel coats the food, it slows down the absorption of carbohydrates and sugars and flattens your blood glucose. By preventing spikes in the blood glucose level you avoid those pesky sugar cravings too. When you stay clear of blood sugar spikes by slowing down the absorption of sugars you are avoiding it from being stored as unwanted fat and that then activates the body to burn its stored fat. The slower the digestion the longer you stay in fat loss mode. Thereis no limit to the choices of weight loss products being sold on the internet. From weight-loss dietary supplements to hunger suppressants, it's not easy to know what product would work for you. Beneficial Ingredients: On top of helping you lose fat, they also support the growth of stronger nails and help your skin glowing. Amazing Taste: Very few diet supplements actually taste good, and almost none have the taste of strawberries, and that means our gummies are a pre-meal treat you will look forward to. 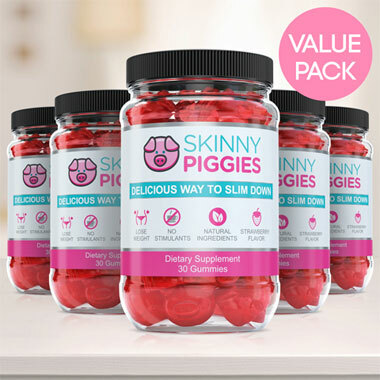 Genuine Ingredients: Unlike other diet pills, it's actually easy to pronounce every ingredient in Skinny Piggy diet supplements, knowing that you're eating high quality ingredients. No Harsh Stimulants: Taking a weight loss supplement without harsh stimulants and that's why you may take it even at bedtime, and our formula without irritants means that the gel is OK with sensitive stomachs. You'll enjoy snacking on these so remembering to take your diet supplement won't be a hurdle. They are simple to use and anybody can get going right away. Try just one gummy Piggie and we're sure they will become a highlight of your day.